Description: A large stone base supports the cannon. The base is inscribed: "Erected 1898 ~ By Lew Gove Post ~ Grand Army Republic ~ And Womans Relief Corps ~ In Memory Of The ~ Defenders Of The Union. 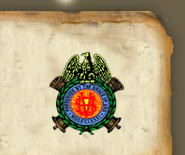 ~ 1861-1865". The cannon is a 6.4" Navy Parrott Heavy Rifle. References indicate that it served on and sank with the gunboat Otsego which hit a mine in the Roanoake River on 9 Dec 1864. The cannon was recovered but saw no further service. 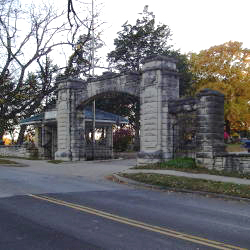 Description: A Stone Archway is erected at the entrance to Sunset Cemetery. 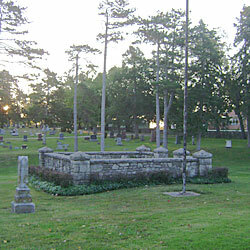 A stone tablet above the left entryway is inscribed: "In Memory Of ~ Our Union Soldiers ~ 1861-1865 ~ Erected By Womens Relief Corps ~ And Citizens ~ 1917". 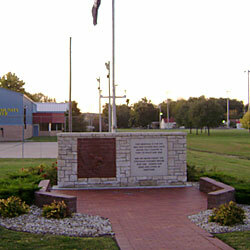 Description: Memorial Day platform and flag pole. (Just past the first small stone culvert, then first road on the left, before the Wareham mausoleum.) 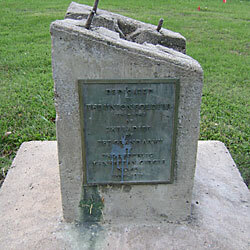 A plaque at the base of the flagpole is engraved: "Erected in 1934 by the R.B. 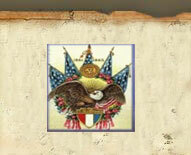 Spilman Camp of the Sons of Union Veterans." 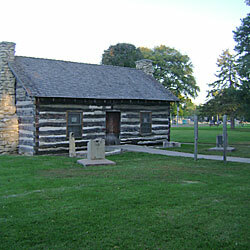 Description: There are two cement cannon mounts in front of the Pioneer Log Cabin in the Manhattan City Park. 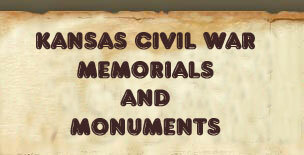 The north mount has a bronze plate reading: "Dedicated ~ to ~ the memory ~ of the ~ Spanish American ~ War Veterans ~ 1898- 1892 ~ by the ~ Wilbur Samuals ~ Auxiliary No 13 ~ Dept of Kansas ~ N.A.U.S.W.V ~ Oct 27 - 1937". The south mount has a corresponding dedication reading: "Dedicated ~ to ~ The Union Soldier ~ 1861-1863 ~ by ~ the Ladies ~ of ~ the Grand Army ~ of ~ the Republic ~ Manhattan Circle ~ No 45 ~ Jan 2, 1937". 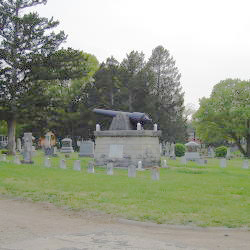 The cannons were removed for a World War II scrap drive. 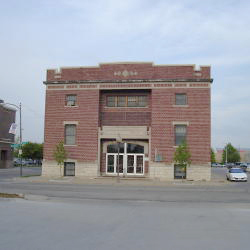 Description: A brick building, designed as a memorial hall has a bronze plaque mounted to the right of the front door reading: "1917 ~ Manhattan - Camp Funston ~ Community Building ~ A Tribute From The ~ Citizens Of Manhattan ~ And The ~ Rotarians ~ Of Kansas, Missouri And Oklahoma ~ To Our Soldiers ~ He Profits Most Who Serves Best". 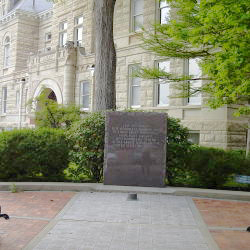 Description: A granite monument in front of the court house is inscribed: "Lest We Forget. ~ This Monument Is Dedicated ~ To Those Brave Individuals ~ From Riley County ~ Who Honorably Served ~ In The Armed Forces Of The ~ United States Of America". Description: This cut stone memorial has an engraved inscription that reads: "This memorial is for the ~ men and women who have ~ served this country in ~ times of peace and war ~ May we never forget the ~ struggles endured before ~ our time. Honor our ~ dead and living in ~ gratitude". To the left of the inscription is a cast brick depiction of an American Eagle.